We are big on music, reading, and educational games in our house. That's why I am a big fan of Twin Sisters Productions. They carry the most amazing selection of book and CD sets with songs that teach. They've just released new product: giant floor puzzles! 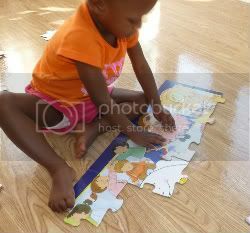 These beautiful 2 ft.x3 ft. puzzle sets are made up of 48 sturdy laminate pieces. Each piece is designed to be picked up and put into place by little fingers. 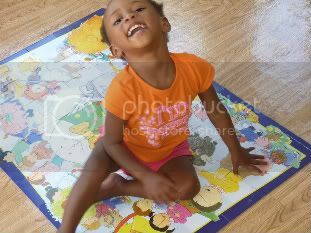 Marlie and Me received a Nursery Rhymes Floor Puzzle to put together. It is wonderfully illustrated with scenes from traditional nursery rhymes such as Humpty Dumpty, Hey Diddle Diddle, and Baa Baa Black Sheep. Since Marlie is under 4 years old I had to line up the pieces for her, but she got a kick out of pressing them into place. She totally gets the concept of puzzles even if she can't put them together by herself yet. The Nursery Rhymes music CD is the icing on the cake. It even includes a printable activity book in PDF. Marlie and me had a blast singing along to the songs and pointing to the corresponding pictures on the puzzle. This floor puzzle was a joy to play with, and I can tell it will provide Marlie hours of fun while she learns for a long time to come! Buy It: Get your own Giant Floor Puzzle for just $12.99...what a deal! Win It: Thanks to Twin Sisters one lucky reader is going to win a $10 gift code to spend at their online store! How to Enter: Use the Rafflecopter Form below to enter this giveaway. 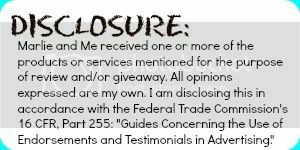 You may leave a comments on this post to as a reminder that you entered or to leave feedback, but they will not count as entries. Deaglan received an alphabet train floor puzzle for Christmas and LOVES it. It was a great activity in the winter. Cool! I've been eying their Spanish and Early Learning workbooks/CD's for a while now! I am loving this Rafflecopter form!